It's been about 2.5 years. 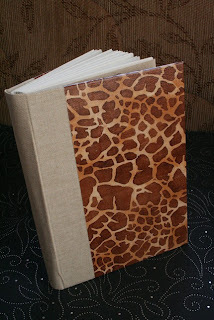 I've always dabbled in it, but became serious about book binding during college, when I took an introduction to book arts course. 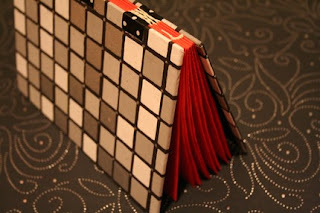 Etsy was mentioned to me casually by a friend who was also into book binding. We actually learned how to make books together. I made art on my own, and tried to get into small art fairs in the town where I grew up, in Connecticut. I was selling to friends and family, though I sold more photography than books. I am a preschool teacher, currently working with 3 year olds. I also go to graduate school for early childhood education--but I consider that my night job! Does anyone help you? I'm in it by myself, though I get a lot of encouragement from family and friends. Never give up on your art! It may seem like no one is really paying attention, but they are. It just takes a while to get noticed. But there are certainly ways in which you can generate more interest. Making treasuries and joining groups helps you become acquainted with members a lot faster, and makes the etsy experience a lot more satisfying. For me, the most challenging part is the gluing. I love stitching the book blocks together, I love gathering all of the beautiful decorative papers for the covers, and I even enjoy cutting the book board. I could definitely do without getting the glue all over my fingers. Not at the moment, but after grad school I would love to focus on getting my art shown in Williamsburg, Brooklyn, and at a few of the fairs they hold in different parts of Brooklyn. "I'll bind this stack of books in one weekend." At first, my friend Laura (CloverGrove) started binding. We'd work together every Thursday night trying out another binding technique from one of the beginner books that we had found. I fell in love. I started taking artist book courses and expanding my knowledge. I also started papermaking around the same time, so I felt I was really putting all of the pieces together. I have been crafting since early childhood. I have been bookmaking for approximately four years. I really enjoy the basic codex, with a cloth spine. My bonefolder. I use it for just about everything. handmade and store bought papers, davey board, irish linen thread, a variety of book block paper, ribbons & love. Children, and the beautiful world around me. I like to look around things, or in between objects. The little spaces unnoticed by others are where my interests lie. The Sims 2 ... which is why I've been slacking on books lately . . . hehe.